Two people have received suspended jail terms after three ponies were found in a collapsed barn, the RSPCA has said. The building was so dilapidated the ponies were not able to stand up without hitting themselves on the roof. Stan and Heather Strelley, both 48, from Kidwelly, Carmarthenshire, admitted four Animal Welfare Act charges relating to 35 ponies. They were given 16 weeks and 12 weeks respectively, suspended for one year at Llanelli Magistrates' Court. Both were banned from keeping ponies and horses for five years. 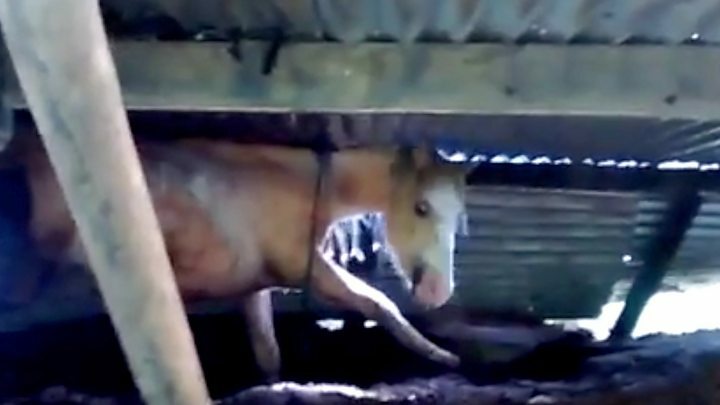 The court heard that in one paddock a number of ponies were left in a poor condition, with overgrown hooves and cuts and scrapes to their bodies. The animals were surrounded by dangerous hazards - including bricks, metal, glass, and old machinery. Inspectors also found the bones of a dead pony on a muck heap. RSPCA inspector Keith Hogben said: "I will never forget the sound of hearing a pony trying to bang his way out of a collapsed shed. "It was an horrific discovery - with three ponies trapped beneath fallen metal roofing sheets, in conditions so horrendous I was left cold. "They were desperate to get out, but had no way out before we arrived." He added: "It is so hard to understand how anyone lets conditions get so bad for their animals."